Knitting is two types: warp knitting and weft knitting. Weft knitting is the more diverse, widely spread and larger of the two sectors, and accounts for approximately one quarter of the total yardage of apparel fabric compared with about one sixth for warp knitting. In weft knitting, the yarns fed into the machine form loops across the width of the fabric. 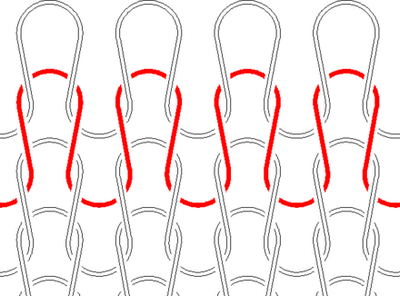 In a weft knitted structure a horizontal row of loops can be made using one thread and the thread runs in the horizontal direction. Most of the knitted fabrics are produced by weft knitting.